Series 2000 Intelligent Pressure & Level Transmitter - HiTECH Technologies, Inc.
Easy programming with 3 push buttons and display without test pressure. The series 2000 pressure transmitter is availabe with 4-20mA and option HART protocol. 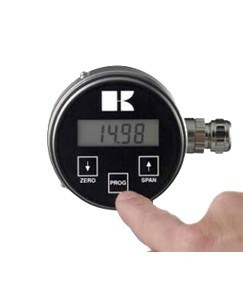 This pressure transmitter is very suitable for applications where a flush diaphragm is needed. For example on pulp and starch. The series 2000 transmitters have a strong flush diaphragm and a small process connection like 1″BSP. ** The latest addition to the 2000-SAN series is the ‘intelligent’ tank level transmitters (shell types) with extended flush mounted diaphragms. These instruments are manufactured specially for the U.S. food & dairy industries, and they are used in all insulated storage silos in U.S. food & dairy plants. All process connections from US competitors are available. Please contact us or check the new brochure for more information.